So, this is my understanding of the current hardware situation and task goals (extrapolated from conversations on PHABRICATOR and the Mission Briefing). This is just my spec proposal, and I would like to have feedback before I begin implementation - or teams are built to take on individual tasks. I know this is utopian. Just the network stacks on each end each need 10-15ms but I think its possible when the system is tuned. including user nonce as "key"
maintain user's preferences and current "nonce"
Physical switches: 2 (reset / user defined) -> what are we using it for? Battery: None, possible with LiPo and charger plugged into the beta power adapter??? Screen Buffers: VDPAU I assume, via HDMI? use intrinsics functions #include "arm_neon.h"
T931: AXIOM WebRemote: Where/How to save data? nothingismagick added projects: AXIOM Remote, AXIOM Beta Software. nothingismagick added subscribers: jatha, sebastian, BAndiT1983, nothingismagick. When you say "Controller" do you mean the WebGUI ? My understanding of HTML, CSS and JS is that it is possible to run it everywhere - in the browser, in apps or even possibly on a touch-screen layer. Toast is not just for Android - it is a method of informing the viewer. Do you think it is a viable model? Is it totally stupid? Is the wording too strong? Are there existing specs that I should have looked at first? For me the best way of helping/contributing would be to participate in small steps like the above tasks rather than start again from scratch or rewrite everything. This is very much an iterative process: we make small improvements here and there then evaluate if we are happy with it, discuss ideas and then make small changes again. i started working on a UI System with Websocket and it needs still a lot of work but i can Communicate with a Server and update values. The current Setup uses a json file (data.json) where the pages / camera functions and diagrams are defined. as a test it's okey but i need to change the data structure to make it more cleaner. here i would like to get some input! Just out of curiosity: Won't this file be too cluttered after defining multiple pages and related controls? Could we use multiple files, like one per dialog/menu, in that case? Great to see you are pushing this forward! i had in the plan to add a drag and drop editor for customizing the interface and functions but that's a task when everything works as expected. you had that request and i need to learn more web coding. Which IDs are involved? Can we generate them as hashes, automatically? Your video looks very interesting, it's also of good quality, if you set to 1080p manually. ahh maybe later vimeo add the HD verson i just seen a 480p version. my progress in the last two weeks where a bit low because i'm on tour (traveling in asia) and i don't know whats the best way to implement the file specification for the camera functions. for the Data validation does the backend service this? is there a GO Demo Server or has that moved to a c++ Server? in my view it would be nice to have one file (csv or json) with all function with the range min/max / default ....description? so if somebody wants to develop a CLI / native app / desktop app / another web app.... it can use that file and gets all benefits. it could be even a csv that gets optimized to each defined app. to get the web app working (PWA) it needs a manifest and a service worker. manifest i have done but the service worker is a open task. the icons will be in a font so it shouldn't be a problem. No problem, trying to help when i can, so we get simpler camera control soon, as many people are afraid of terminal usage, which can be confusing sometimes. Like i said before, the plan is to provide a JSON data on demand with all available methods per module, like image_sensor, general etc. (the classes you've asked about), which would also hold more information like ranges and such. Format is not fully defined yet, let us talk about it as soon as i have finished the general parameter handling, so we have a base for discussion. On demand, because it should be gathered automatically by the daemon, for certain models/revisions/versions. Static file would require permanent maintenance, when new things are added to the camera, like modules. Current plan is, to get things up and running sooner, to use manual string conversion (docs will follow), as we use JSON and flatbuffers. Later it can be extended. Another point is, where i'm not sure about, but will follow for now: to set and get things, the parameters should be prepend with "set_" or "get_", e.g. "set_gain" and daemon selects correct handler method. Other approach to this, would be a path of REST, where the command is set explicitly, e.g. for JSON: command: "set", parameter: "gain". If we have a stable system, then i can investigate overloading of handler methods and their binding. @Francis: Have committed adjusted daemon version, haven't tested websocket server yet, but will try to do so using your code. At least to see, if responses are coming back to it. @sebastian: Will try to add some parameters from your list, as example. Thanks, will check it, but also try to connect your app to the real websocket server from the daemon project. @Francis: Tried to execute your app, but the problem is, that it relies on some stuff, which throws cross-domain errors and refuses to work. Also the font shouldn't be loaded from internet, but from a sub-folder. Edit: Or can we surpass cross-domain exceptions by pre-compiling? the current version on github should work i also have got a newer version with local icons but i need to investigate more for optimizing it and fix some small bugs. Have hoped to do it without a server, as it should be self-contained later. The plan, which was created by another user (Task T937), is to send the whole app package to the client (e.g. smartphone) on first call. This would allow to avoid the need for a web server on the camera and spare resources. But i can test with a simple server locally for now. Wanted just to give you the idea of the overall plan. @Francis: Do you need some assistance for the setup? I'm usually using gulp, but grunt also shouldn't be a problem. The PWA can be hosted on apertus.org example: app.apertus.org and in the app the camera ip has to be added for the websocket. then you don't need a http server on the camera and all updates can be hosted on app.apertus.org. The PWA can disable/enable the http server on the apertus camera per websocket. note: PWA is to make a Web APP that can be offline, works on Desktop / Mobile like a normal app and you don't need a installer or any kind of add-on ( cordova ). it only needs a manifest ( have made one) for define the app and a service worker (open task) that checks in the background if there is a update or not and some other functions. We don't know if camera users will have internet connectivity where they are shooting so serving from apertus.org is not a good idea. Whats the problem with having a http server on the camera? Its already prepackaged and available. Updates to the WebRemote can be done with the camera firmware. 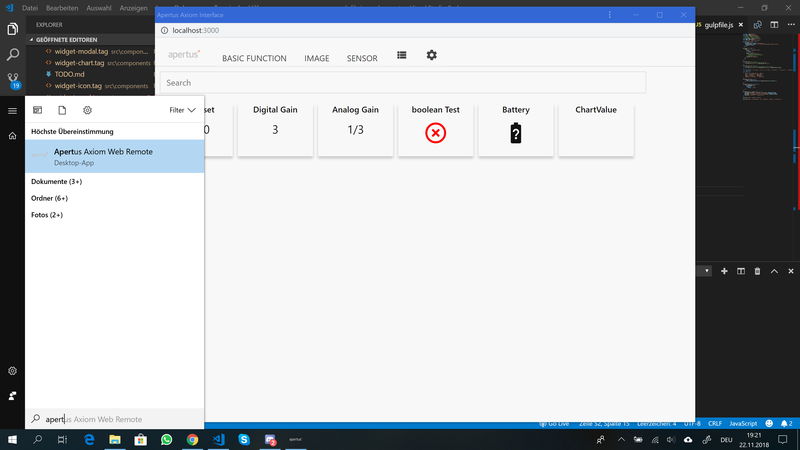 worst case as example : when there is a ressource limit on the fpga us another MCU example a ESP32 (cost 8-10$) with some free flash it's possible to integrate all there websocket and http stuff and communicate to the fpga with serial. i'm sure most user will test first there setup at a location that has internet. You identified the problem yourself already :) -> what about the other users who didn't do that beforehand. We currently use lighttpd. The webserver runs on the CPU not the FPGA and while resources are of course not unlimited there I don't see any issues of having lighttpd idle along when nobody sends any requests to it. I agree that its important to familiarize yourself with the technology but still we cannot punish users who didn't. What if your smartphone is out of battery and in the field you need to switch to a different one... -> least possible obstacles is the goal. Improved a bit and fixed small problems, also added build.sh. i will add it when i have done some other updates that are currently in the works in the end of next week. hope that is okey for you. btw: did the websocket worked? No problem, adjust it to your liking, just assisting with some infrastructure. Websocket has connected, after my adjustments, see the code, but haven't got much further, as it expects the JSON database. Will try to adjust it, so it actually tries to retrieve it from websocket server, as i'm not sure, if we should maintain separate JSON config file or not. Current plan is to provide it dynamically by daemon, on request. The question is more if there will be a function to store the GUI setup on the camera. I would like to integrate interface customisation, favourite selection and other stuff that is not realted to the camera hardware. We can for sure embed it in a JSON file on the camera and send it together with other stuff back. Will resume to inspect your code in a moment, as i want to get exactly this part of comms done, before proceeding with adding parameters. Adjusted UI code a bit, so it would send correct message on reload, to get available params. Also adjusted websocket server processing, so the response will come back with real data from daemon. Will try to do final tests today, before uploading it. Another thing we should consider, and which was already on the TODO/discuss list for quite some time, is the split of beta-software repo, by moving modules to new repos and linking them as sub-modules. This would be more manageable, as modules grow more and more. I could include browsersync setup in gulp, for live preview/reload and CSS streaming, while developing UI. Anyone interested? The gulp serve would make sense for the development, have seen it in the docs bit not try it out..
Nah, not gulp serve, but browsersync. It reloads HTML page on the fly, when it detects changes to HTML or JS files. Also you can stream CSS changes, without reloading the page, which saves time. Also you can adjust it to compile and then reload on changes to Tag files, as an example. Really nice stuff, using it when i can for web development, latest one was development of a Drupal theme, done with this live preview. See pcb-aoi apertus repo on Github for an example. Here is the version with browsersync support. Lost my websocket adjustments, but there were only few, which is not that tragic. Try to modify CSS, also just save the file afterwards, browser shouldn't reload the page now, but the changes streamed to it, like new text color. In case of problems, just give me a note. Great to see things flowing so steadily here! Shall I give you commit access to github so you can more easily commit/collaborate on code? Should we start separate repo for it, and add as submodule to beta-software one later? This would allow to do things in parallel, like independent CI builds. Then a new repo please, with commit rights for us all. You could upload latest version, so Francis can commit his changes over it, then we can inspect the differences. I've adjusted his code a bit, as showcase for Browsersync stuff, but not very much. Please check the code, getting unexpected token "<" in browser. Nothing to be sorry about, just normal development cycle. Preparing the VM currently, which will hold the web UI dev environment. It consists of Manjaro (XFCE) and Atom.io mainly. Will try to add some plugins, like eslint, after that we have to do a short discussion about code style, e.g. semicolon yes/no, single ' or double " quotation marks for strings and so on. Have my own preferences, but wanted to talk to majority about it. Is the Dev VM only for the server or do you want also the web-remote development in the VM? Dev VM is planned for UI development in first place, then i hope to move daemon to another repo and also place it there, for comm tests. Is the riot compiler JS still required? As currently pre-compilation is done by gulp. For the style guide do you want to use a predefined one like google js style guide or what ever there are some to select? Have added simple eslint config with settings i'Ve already mentioned before. Don't have any other special preference at the moment. I sorry for some delays i'm still on new widgets. I will updated some code for next week. Maybe this one is better -> https://github.com/ygoe/msgpack.js also consider gzipped versions, where your 50kb file is only 14kb big. I like to have a tiny project even when there are font's and images that makes it big. It takes more time but to develop but on the end it's not overloaded. If we sort out small things, then we can try a test on the camera at the apertus° hub. Will do preparations, to see if the daemon can be controlled from CLI first, although i know that at the moment it has its quirks and ends the connection, as there is no handler to resume waiting when client disconnected. the only reason at the moment that it sents "1/3" is you can sent a custom value over the searchbar! it can be changed. for the development i was finding it would make things simpler when you also have the option to sent custom values. 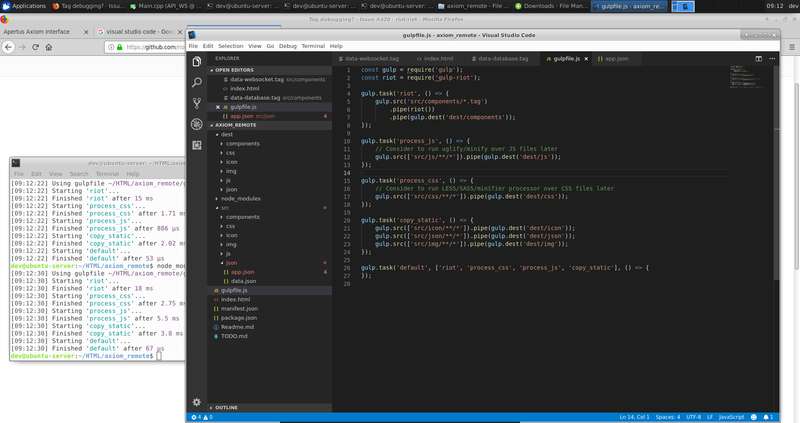 Note: i add from anuejn his files so it uses now npm for running grunt. Will check it in the next days, have no time as another work travel is on tomorrow. At the moment i'm on the icon generation for to have only the required icons to be load. Other task are mostly code cleaning and fix some bugs in searchbar. Right. Bandit will take care of the testing on actual hardware I assume. Just a quick update, tested the daemon with web UI and it works great. Of course current setup is still not finalized and daemon runs as app, so it can be killed directly, but "analog gain" setting works fine (done some test snapshots). Next step will be some adjustments to the comm packet, so we have dedicated command parameter for get/set (a bit like REST), so the part of splitting "set_gain" to check the command will become obsolete and the code easier. Adjustments to the daemon are done, see comm packet. Also added digital gain and reworked analog gain. create widget-element for next bigger UI update hasn't been much done yet. i think next week i will push some more updates for dev server and client websocket, specialy error handling and reconnection.